Jonathan has always had an interest in finance. “Working with numbers always made sense of things for me,” he says. Today, he spends his time helping FFP Wealth Management clients make sense of their finances as they work towards securing a comfortable financial future. As a Certified Financial Planner™ (CFP®), Jonathan’s expertise includes professional money management, investment planning, retirement planning, educational planning, estate planning and business planning. Jonathan graduated from Baruch College’s Zicklin School of Business in 2008 with a BBA degree in Finance and Investments. While attending Baruch, he began a position in UBS’s Wealth-Management division where he worked closely with a leading financial advisor. After holding a similar position at Merrill Lynch Wealth Management, helping others plan their financial futures was the obvious choice. “I began working in this business while attending college and have never left. It’s where I belong,” said Jonathan. Although Jonathan enjoyed working at large Wall St. firms, he values FFP’s commitment to providing independent and objective advice for clients with a high level of personal service. Jonathan is committed to helping clients achieve their short and long-term financial goals including growing, protecting and conserving assets through professional and personalized service with a complete lineup of financial-planning solutions. “At FFP we provide a big-picture approach,” he says. “With no proprietary products we are free to find the right investments and strategies for our clients. The plans we assemble are fully personalized and comprehensive, incorporating each detail of the client’s financial concerns. 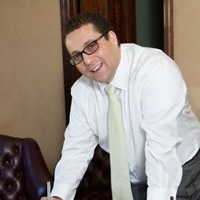 We also work closely with our clients’ CPAs and attorneys to be sure that their financial lives are fully aligned with their personal goals and objectives.” FFP clients benefit from the big-picture approach as the firm prides itself on being able to determine a specific course of action for each client so they have a unique step-by-step plan. In his spare time, Jonathan loves spending time with his wife, Inga, and their two-year old daughter, Ariella. A former school soccer player, Jonathan enjoys playing golf and watching football with friends.